This entry was posted on October 30, 2010 at 2:07 pm and is filed under Education, Politics with tags Browne Report, cuts, David Willetts, funding, HEFCE, Universities, Vodafone. You can follow any responses to this entry through the RSS 2.0 feed. You can leave a response, or trackback from your own site. I believe government interests are nearly inseparable from the interests of industry any more. Government is only concerned with people through that tired “trickle down” notion, from industry. Arts and Humanities, to this mindset, is unimportant – it doesn’t create graduates who are aligned the best for capitalistic purposes. In fact, arts and humanities can even be considered problematic to capitalistic purposes. The only time arts and humanities should be funded is when that funding comes from private interests (which are generally concerned with capitalistic things). Having all education funded through corporate means is the best way to insure the status quo remains. Sciences like Astronomy and Cosmology are not so important, as their results are not easily recognizable as profitable. It is, however, an emblem of prestige. But these emblems are less significant in a global economy that is increasingly less concerned with national identities, beyond what they commercially consume or produce. What deals with money interests receives the backing of governments. Everything else continues in decline. And this can be solidified by placing all education at the mercy of money interests. A great example can be found, even when you look at education already geared toward industry, in the enormous amount of funding science departments at several key US universities receive from oil/energy companies. Of course you can say all sorts of things about academic integrity, but it is not standing up to scrutiny. This all is, I think, one of the most important issues of our time. This is obvious, though, isn’t it? I certainly hope that it is. Hang on, there was a huge expansion of higher education under Major then Labour to 50% of the A-level-taking population. That means teaching to the median ability of the population. That means serious dumbing down of courses. I’d not be sorry to see this reversed even in a time of plenty. If that is the government’s aim then I regret only that (1) they don’t have the honesty to make the case; and (2) they are not doing more to ensure the quality of the courses and institutions that survive. Any higher education institution, not just the LSE, is free to go private if it wishes. The University of Buckingham has been around for a while now. The problem is that this is all being rushed through so quickly that there’s no guarantee that what happens will be that the dumbed-down courses disappear. It is not an unreasonable argument to suggest that what we really need is for some of the current “universities” to become Further Education colleges or some other type of vocational training institute, but I don’t think this is the right way to achieve that end. Universities in the UK are basically constituted as charities, so they are all in some sense independent of the government. However, they do accept state funding for UK students, for which the government imposes a considerable price in terms of administrative overhead. Buckingham is, as you say, fully independent of the state. It offers 2-year degrees in a limited range of subjects. Perhaps that’s what the future has in store for a number of current universities. But what the future has in store for the likes of Thames Valley and Luton, is much less clear..
That’s five times this week I’ve indulged in litotes. In my middle age I’m turning into John Major. There is no way that the current trends can be portrayed as a rewind to the days of high quality education to a smaller cohort. The expansion of the last 25 years took place under substantial cuts in the funding-per-student; while it may have been government policy to expand participation, the extra students were essential to universities to survive the per-student funding cuts. 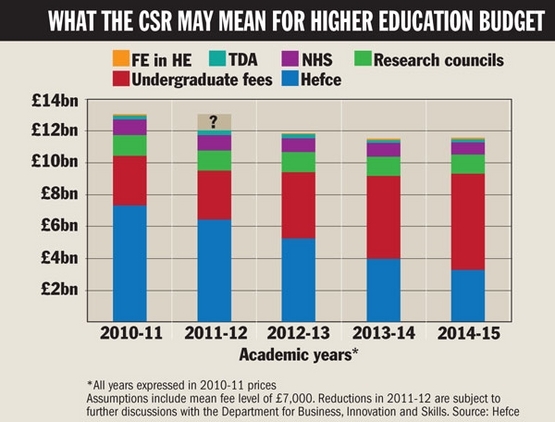 The new proposals demand another massive cut in funding-per-student, threatening the survival of large segments of HE. If universities were to additionally contract in numbers of students (by choice or by competition) they would surely go to the wall, and any that remained would be a faint shadow of their former selves. The rewind is of course impossible, because while previous governments were politically able to argue that the sector ought to be able to teach twice the number of students for the same total funding, no one is going to be able to make the political case that the number of students should be halved without the funding being reduced by at least that factor. Andrew: OK, if it is not financially possible to rewind 15 years then lets rewind 25 years, the figure you mention. Too bad the government doesn’t have the guts to make the case using the financial arguments you quotte and the ethical ones I quote. But isnt the problem that we now have essentially a single tier system and everyone goes to “university”? In the past, we would have had polytechnics, colleges of technology, technical colleges and even “night school” where everyone could find their niche and improve themselves. Now, everything and everyone is wrapped up into a one-size-fits-all university education. There is no longer any choice, no diversification and no allowance for the fact that a formal university education is not suitable for everyone. It’s clear to me that this is unworkable for the future. We need the choice and the variety. However, it would be wrong if true scholarship in the arts and humanities was made to suffer. I’ve been wondering wether the timing is part of a political ploy to win the vote on tuition fees in parliament. First take away the money, then when everyone’s screaming the loudest put the vote to parliament. This would put a lot of pressure on the Lib Dems who pledged to scrap tuition fees: vote for higher fees or watch universities going bust. Who knows! ?